Should You Use the New Twitter.com or a Twitter App? Web apps! They're more and more like real apps. Take the new Twitter.com. It's pretty damned amazing. 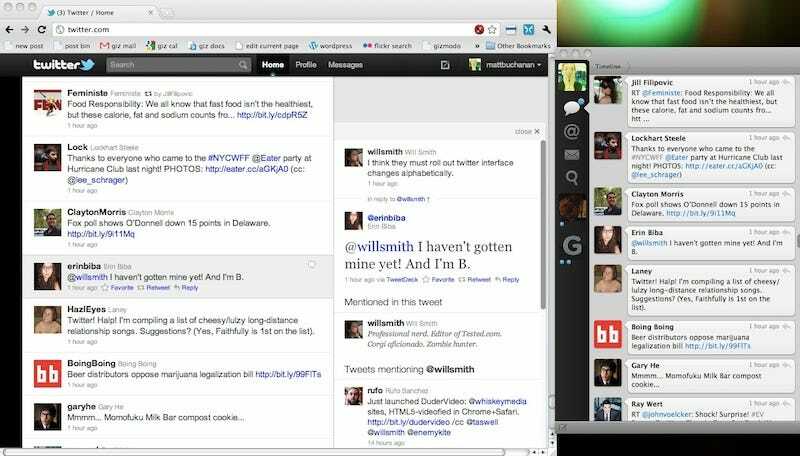 Is it so good you can ditch desktop Twitter apps forever? The new Twitter feels a lot like an application, slapped on top of Twitter.com. That's partly because it's built like an application. It uses the same Twitter API that any third-party app does. The two-pane split view recalls the iPad Twitter app, and the design intent is largely the same: to keep you on Twitter.com while you're consuming the content the people you follow are tweeting. The right pane is like an activity panel. It expands out to show conversations between users, photos, videos, profile info, location and more. And the whole thing flows insanely smoothly and dynamically, like an app. There's infinite scrolling, so tweets keep coming as you scroll down. When you click the arrow to expand a tweet into the right panel, it shoots out like a card. There's even keyboard shortcuts and autocomplete like a real app (or Gmail, another exemplary web app). My default desktop app is Tweetie. It's simple, it's native, and it's mostly everything I need in a Twitter app. I can switch accounts, run active searches, view conversations and check out photos within the app. The new Twitter does nearly all of that just as well as Tweetie—except account switching—and it has features the deprecated Tweetie doesn't, like native-style retweets and geolocation. The new Twitter hasn't replaced Tweetie, because Tweetie's always right there on my desktop, but for the first time, it feels like a legit alternative. I don't feel limited when I go to Twitter.com anymore. The people who will feel limited? Power users who run apps like TweetDeck that take up an entire second monitor, with a bunch of accounts and searches running across ten columns of information constantly flowing down their screen like code from the Matrix. Or crazy rich people who use an iPad as a second monitor just for Twitter. New Twitter just doesn't provide that kind of firepower, because it's not meant to. But for most normal people, you can probably stop searching for the perfect Twitter app, if you've been looking for something relatively simple but powerful. It's at Twitter.com.